THE NEW YORK TIMES BESTSELLER. A couple in their thirties live in a small rented cottage in a quiet part of Tokyo. They work at home as freelance writers. They no longer have very much to say to one another. One day a cat invites itself into their small kitchen. She is a beautiful creature. She leaves, but the next day comes again, and then again and again. New, small joys accompany the cat; the days have more light and colour. Life suddenly seems to have more promise for the husband and wife; they go walking together, talk and share stories of the cat and its little ways, play in the nearby Garden. But then something happens that will change everything again. 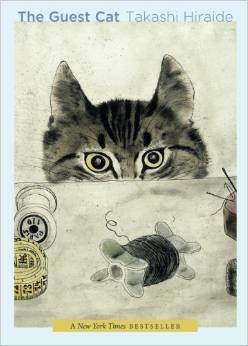 The Guest Cat is an exceptionally moving and beautiful novel about the nature of life and the way it feels to live it. The book won Japan's Kiyama Shohei Literary Award, and was a bestseller in France and America. Are you a translator or interpreter looking to advance professionally? Join JAT today! Find out what questions are being asked (for example, how to find a translator). © 2011–2019 Japan Association of Translators. All rights reserved unless otherwise stated. JAT and IJET are registered trademarks of the Japan Association of Translators.